Anything is better than drinking lead-poisoned water. But when Walmart, Coca Cola, and Nestlé are the only ones stepping up and offering alternatives, the future looks pretty grim. Today, a coalition of America’s largest companies announced that it would be putting together a trucklift for Flint, collectively donating water to meet the needs of the city’s 10,000 school children for the rest of the calendar year. The companies are also encouraging others to support the Flint community through the nonprofit website Good360. This is all very good news for the water-strapped citizens of Flint. But you know who else depends on the likes of Walmart for safe drinking water? People living in third world countries that lack basic sanitation. Seriously now. Where the hell is the government? 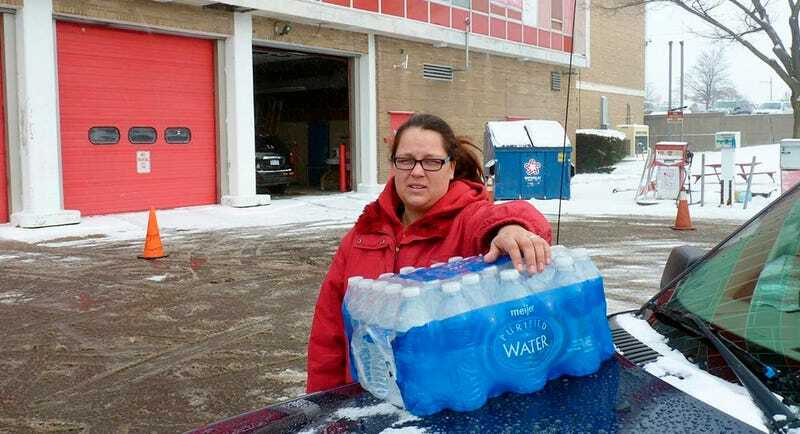 Where are people that landed Flint in this horrible public health crisis in the first place? Walmart has been donating water to Flint since July of 2015, and six months on, the taps are still churning out industrial waste. As The Atlantic points out, water donations from the entire state of Michigan don’t come close to the amount of clean water Walmart, Coke, Nestlé, and Pepsi have agreed to shore up—the equivalent of 6.5 million bottles. As convoluted as it sounds, corporations are now bailing Flint out with water from other municipal supplies, which is exactly what the state of Michigan should be doing in a regulated fashion. But if Walmart and Pepsi really wanted to help Flint, they’d be offering up money and resources to help fix the city’s broken infrastructure. At best, this is a short term solution to a massive problem. At worst, it sets a precedent of depending on for-profit companies to fill the role of basic utilities. And that puts us on a path toward a very scary future.